Posing on my throne, as my granny calls it (it's just a chair with a large cushion she made for me) It's really comfy and I love gazing out at the birdies through the window! Just don't let that nasty tom cat from up the road come prowling around the patio door again, trying to annoy me. We have one of those nasty Toms here too - I was really mad the last time I saw him! Better start filing those nails... just in case. Don't let that neighboring tomcat get to you. You're the queen of the castle, Athena! We don't like the introoder kitties either, Athena. We hope you have awesome bird TV today, no tom cats! I know. Some can be quite horrid! Oh yes, my claws are very sharp! You're right! A queen and a goddess! I saw lots of birds, and a fox too! I am on this photo! How dare another cat enter your domain! He must not know who he's dealing with! Bark More, Growl Less Barking from the Bayou! That tom needs to learn some manners, Athena! The nerve of him to disturb you, especially while you're on your throne. You don't have to tell us about annoying neighbors ... we know all about that. Hope the annoying Tom let you have some so you could enjoy your nice throne. Happy Wordless Wednesday! Hey Athena, relax and enjoy your throne. Ugh, dat would be annoying! You are such a pretty girl, Athena! You're right, boys can be really annoying. Don't they know to leave us girls alone when we're trying to get our beauty sleep? That is a gorgeous picture of you sweetie. You are the Queen of your neighborhood, Athena. You look simply lovely, Athena. 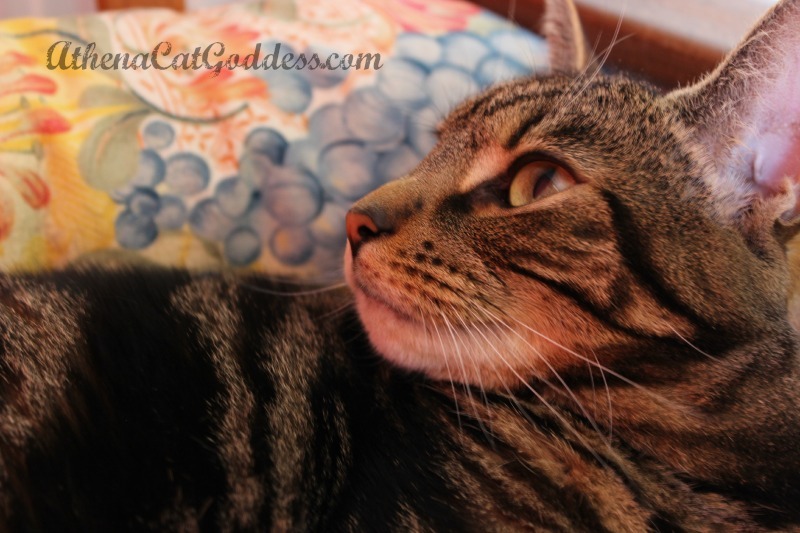 You can't blame the tom cat for wanting to catch a glimpse of your beautimous self, Athena. We are surprised they aren't lined up at the window!